One of the most overlooked sources of recycled materials in the garden is the humble wood pallet. Millions of wood pallets are used in the retail industry to transport goods, and they often end up clogging the landfill. In addition to being a source of free raw materials and a way to recycle in the garden, making things for the landscape out of pallets gives you a product that no one else has. Put your signature on one of these wood pallet garden ideas (starting with this creative planter idea! ), and see what you can do with a few tools and a little sweat equity. What happens when a garden path isn't just a way to move through the landscape, but becomes a focal point in itself? Funky Junk Interiors shows that even when dismantled, a wood pallet can serve as a stunning design element in the garden. Although a wood pallet walkway will help your garden by keeping you from compacting wet soil, it's best used in a low-traffic area of the garden: no heavy wheelbarrows or garden carts here. Because pallet boards are thin and already weathered, a bit of preparation can help your path last beyond a few seasons. Rather than laying the pallet wood directly on the soil, excavate the area a few inches underneath the path and backfill with gravel. This will help water drain away from your path, preventing rot. After a hot day of pulling weeds and fighting insect pests in the garden, a rest on a garden bench is a well-deserved treat. At first glance, a wood pallet might not seem like it has the potential to transform into a beautiful piece of garden furniture, but as the blog Our House Now a Home proves, some inexpensive paint and a few throw pillows can turn scrap wood into an Instagram-worthy seat in your landscape. Building furniture from wood pallets requires some shooting from the hip, but the results are limited only by your carpentry skills. Look for free woodworking plans or youtube tutorials to remove some of the guesswork. Once you've mastered the bench-making basics, you may even decide to attempt a garden rocker or recliner. 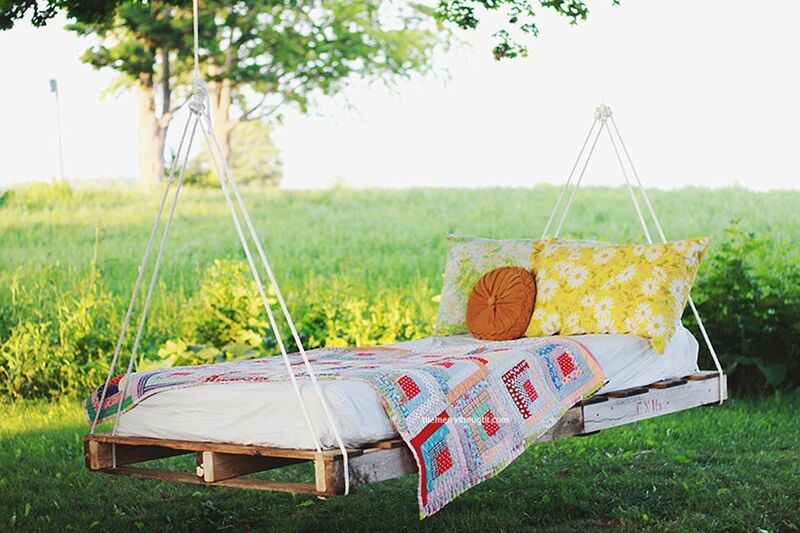 There's nothing new about the garden swing, but a garden swing bed is the best thing since spiked lemonade for true relaxation. Buying a fabricated garden swing bed can set you back at least several hundred dollars, which is a real buzz kill for the lazy gardener. The Merrythought used 2 x 4 lumber to reinforce two wood pallets, and topped it off with a mattress covered in vinyl zippered mattress covers. You could also make your own cushion with outdoor patio fabric if you're handy with a sewing machine. Make sure you use rope with a high working load limit and have a suitable branch to hang this beast from, as it will weigh several hundred pounds when occupied. The raised garden bed isn't going anywhere as a method to practice intense flower or vegetable gardening in a small space. The soil in raised beds warms up quickly, the elevation raises vulnerable plants away from ground dwelling plants, and the loose, friable soil you add to raised beds promotes the healthiest root systems on all types of edibles and ornamentals. Line your raised bed with landscape fabric to keep the soil from migrating out when you irrigate your plants. The ideal height of a raised bed is six to 12 inches, but you can go higher if you reinforce the walls with staking to prevent outward bowing. Who needs a compost bin in the garden? Anyone who has a bottomless appetite for soil-boosting humus, also known as black gold for the garden. You have several choices for compost bin construction when you start with a wood pallet. A heavy-duty pallet can serve as one of three or four sidewalls of a bin, attached with brackets or simply wired together. If the pallet is coming undone, dismantle the boards and attach them to a frame you make with 2 x 4 lumber pieces. Gardeners with small plots can get by with a single bin, but those with larger spaces can reap the benefits of an open-sided three bin system constructed of pallets. The first bin holds fresh garden waste and kitchen scraps, the second bin is used for moving and turning the decomposing materials, and the third bin holds finished compost ready for use. A three-bin pallet system isn't much to look at, but you can pretty it up by planting a few flowering vines around the outside, which will flourish from the nutrients within the bins. Vertical gardens are the solution for homeowners who desire flowers, herbs, or vegetables but lack the space to grow them. 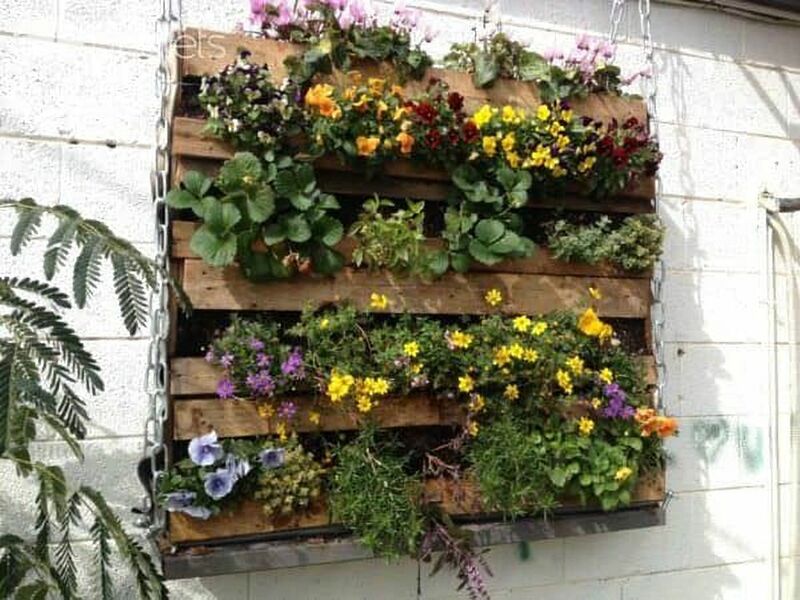 A living wall may consist of a pallet you fill with soil and plants, or the pallet may serve as an anchor upon which you attach pot-holding clips. These planters are very heavy when loaded with wet soil, so mount them securely with cleats, large wood screws, and metal brackets; or, rest the bottom of the pallet on the ground for added support. This riff on the planted wheelbarrow leaves your real garden cart free to haul mulch and dirt, while the wood pallet version accommodates pumpkins, ornamental cabbage, or whatever's in season in your garden. Serendipity Refined added some vintage iron wheels to complete this wood pallet charmer, but you could also build some ornamental (non-functioning) wheels from pallet wood if you don't have metal wheels available. Take the backaches out of gardening with a wood pallet raised planter box like this one from Her Tool Belt. The slats on a wood pallet are just the right size to tuck in a few petunias, million bells, or other trailing annuals. These large pallet planters have an edge on hanging baskets, as they hold a large volume of soil that resists drying out. For an even more drought-tolerant display, add perennial succulents to your planter box. It's true that good fences make good neighbors, especially if your neighbors have four legs and a taste for hostas. The wood pallet garden fence may not exclude adamant pests like deer, but it can repel rabbits, dogs, and woodchucks from your prize roses and tender cabbage plants. Long fences face stability issues, but Realeyes Homestead addressed that by adding support pallets in an "H" pattern. The addition of some plastic bird netting can add a layer of pest-excluding protection to your wood pallet garden fence.